I was never a fan of English cooking or dates until I tried this recipe. Sticky toffee pudding is a British dessert. 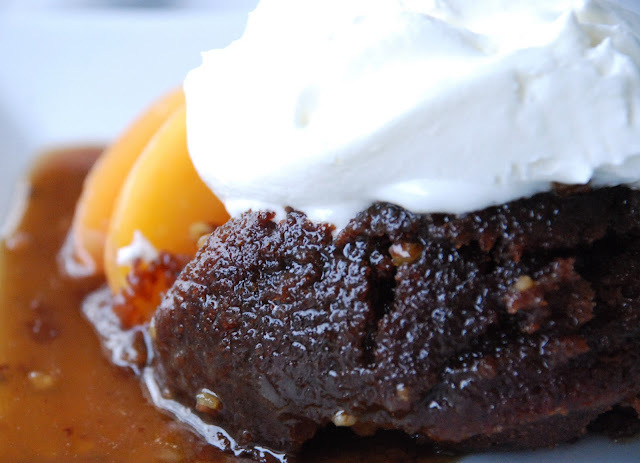 It’s a moist sponge cake with chopped dates or prunes and is served covered in a beautiful toffee sauce. The best part - It’s even better the next day – that is if you have any leftovers. I put some leftover peaches with it. Preheat oven to 350 degrees. Butter and flour an 8-inch round cake pan; set aside. In a small bowl, combine dates and 1/2 cup boiling water; set aside to soften, at least 10 minutes. In a medium bowl, whisk together flour, baking powder, and salt to combine; set aside. With an electric mixer, beat butter and sugar until light and fluffy; add eggs, one at a time, beating well after each addition. Add date mixture, flour mixture, and vanilla; mix just until moistened. Spread batter in prepared pan or individual ramkins. Bake until a toothpick inserted in center of cake comes out clean, 55 to 65 minutes. Meanwhile, prepare toffee sauce. In a medium saucepan, combine butter, heavy cream, light-brown sugar, and salt. Heat over low, stirring, until sugar has dissolved, about 2 minutes. Simmer mixture over medium heat until reduced to about 2 1/2 cups, 8 to 12 minutes. If desired, reheat sauce over low before serving. Remove cake from oven; cool in pan 5 minutes. To ensure it will come out easily later, carefully invert hot cake then return it, right side up, to pan. Using a toothpick, poke holes all over cake. Pour about 1 cup warm sauce over cake; let absorb at least 20 minutes.